Amidst a year of standout scenes in American summer movies — Wonder Woman tearing through no-man’s-land to confront the German soldiers, anything Tiffany Haddish says in Girls Trip — there may be no more joyful moment than (a nearly unrecognizable) Cathy Moriarty as Nana Dombrowski in the just-released Patti Cake$, croaking out the letters “P.B.N.J.” in a carcinogenic wheeze to be sampled, scratched and looped across her granddaughter’s hip-hop debut. Directed by Jersey boy Geremy Jasper in a tonal blend of music video energy and a low-rent star-is-born glamour, the Garden State-set film Patti Cake$ is a bridge-and-tunnel 8 Mile adjusted for gender and local color, though it packs a bigger emotional wallop than that Eminem origin story. 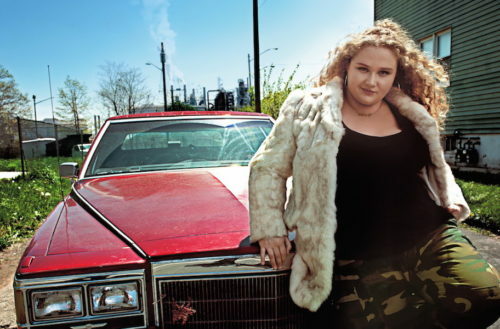 Patti Dombrowski — the radiant Danielle Macdonald — goes by many names, including Patti Cake$ and Killa P (her rap alter-egos) and, to the teasing dead-end local boys, Dumbo, due to her curvaceous nature. She lives, in lower-class squalor, outside Newark with her sickly Nana and her blowsy single mother Barb (New York cabaret star Bridget Everett in a forceful turn). When not tending bar — where her mother gets shitfaced and performs karaoke in a throwback to her glory days as a hair metal wannabe — Patti hangs with her BFF and co-MC Jheri (Siddarth Dhananjay), dreaming of hip-hop glory and planning to break out of their low-class circumstances, later with the help of the mysterious Basterd the Anti-Christ (Mamoudou Athie), a disaffected young black guy with a bent for speed metal and a run-down shack where these outsiders convene to create and, hopefully, escape. Workshopped through Sundance, Patti Cake$ had its premiere there this year to two standing ovations (and a lucrative distribution deal with Fox Searchlight). Though you’ve seen it before, Jasper brings fresh nuances to narrative and emotional shadings that are surprising and unexpected. The three main actresses — Macdonald, Everett and Moriarity — play out the passions and frustrations of three generations of strong-willed and often blindsided women. And the original songs created for the film, primarily by Jasper, are wonders, especially when the multicultural influences of the women and their Indian and black collaborators meld together. Moriarity as Nana de-glams herself to such an extent that it wasn’t until the end credits that I knew her name. It’s a far cry from her performance in Raging Bull, and though she gives all end-of-year awards hope to her co-star Macdonald, the veteran actress might want to keep the night open for next year’s Academy Awards. Which brings us to Danielle Macdonald and her transformative performance, though for most of us this will be the first time we encounter the actress. The way this Australian woman flawlessly embodies a downtrodden suburban Jersey girl — from the region-specific accent to the barrage of words that couldn’t have been easy for a performer who’d never rapped before — is to bear witness to the imaginative purity of acting itself. Criticisms of cultural appropriation be damned, the story of Patti Dombrowski is the truth of all dreamers who want a better life for themselves regardless of class, race and gender. And the film is such a celebration of the multi-cultural melting pot of America that it’s only a matter of time before our president starts to hate-tweet about it. Patti Cake$ is in theaters today.